Wow! My first guest blogger post! How awesome is that? I am terribly excited and very happy to introduce the wonderful Sarah Volpe, and I bid her a warm welcome to my FoodFlurries website. Sarah and I first met back in Melbourne when we both worked for the same hospital. She is originally from the UK, but now lives (I’m very jealous!) on the resort island of Koh Samui, Thailand. She is a lover of South East Asian cuisine and she loves to find inspiration for her dishes at local restaurants and from the street vendors that Asia is so famous for. This young lady is super-duper well travelled; like name a place on the map and I am sure she’ll tell you she’s been there. Everywhere from Turkey to Russia, Estonia to India … she’s seen it all. These days she has her own food blog, and you can read all about her and her culinary adventures in South East Asia on the Spicy Buddha. 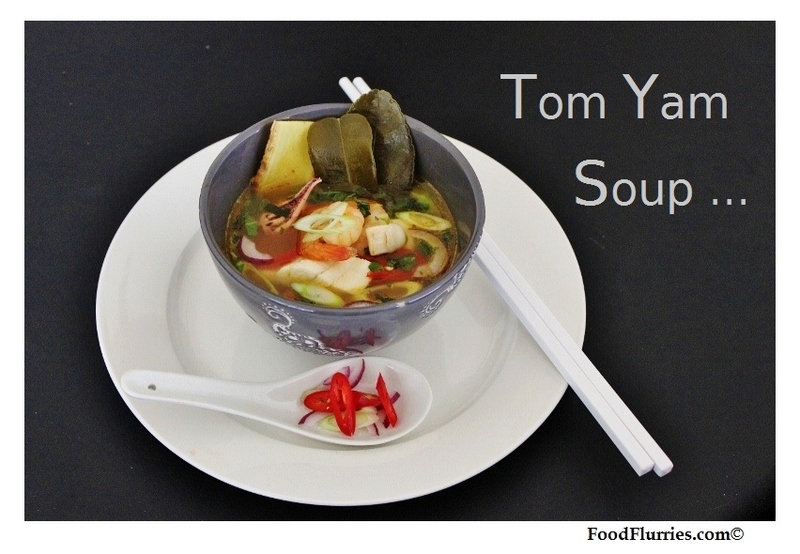 Today she has graciously shared with me a recipe for Tom Yam Goong, that classic of all classic Asian soups. It is a clear hot and sour soup, often times made with seafood. Chicken varieties do exist but I strongly suggest the seafood version. Despite the fact that this soup originates in Thailand, it’s popularity is widespread, making it widely available in Malaysia, Singapore and Indonesia. Many Asian restaurants in Melbourne have this soup as a staple on their menus as well. So anyway here is Sarah’s Tom Yam soup contribution, I hope everyone enjoys it. I find if I don’t have an Asian inspired soup several times a week I start to get withdrawal symptoms, like caffeine it’s addictive! 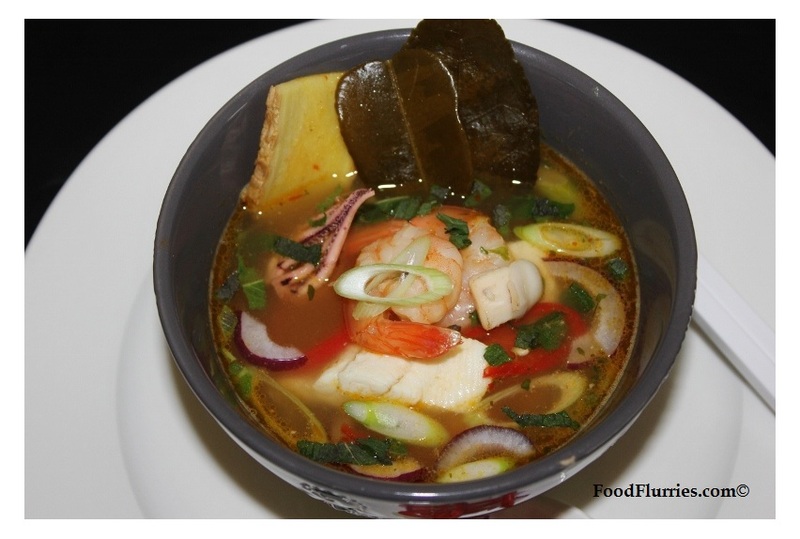 Simple, unpretentious and super healthy Tom Yum soup is enjoyed in variations all over South East Asia. In Thailand this soup is known as Tom Yam. This lovely recipe is inspired by a Thai friend of mine who is a wonderful cook so no need to question its authenticity! The key to all delightfully aromatic Asian soups; Thai, Vietnamese or Malaysian is the broth. Try and make homemade chicken stock if you can (you can even boil down last night’s roast chicken leftovers). This soup serves 2 people and is mildly spicy (it does have a kick) it won’t set your tongue on fire. Allow 15-20 minutes preparation time and 5-7 minutes cooking time. My top tip with cooking most Asian inspired dishes is to prepare all your ingredients in advance so you can just line them up and add one after the other (just like they do on TV). Take a look at the list of ingredients and very simply add them all in that order. Firstly put the chicken stock on a high heat. This dish cooks very quickly so you can leave it on a high heat (bubbling is fine). Add one ingredient after to the other. When you get to the prawns they will cook very quickly on a high heat which is why you don’t add them at the start. Watch the prawns turn a beautiful pink colour as the cook. The soup should be ready within 5-7 minutes. Taste your dish before serving; you may want to add more chilli. You will instantly notice the strong fragrant flavours of lemongrass and ginger, both a really delicious taste. So there you have it, a simple yet refreshing soup that really packs a punch in the flavour department. Thanks for the post Sarah!! It looks scrumptious and I love seafood especially in this dish. Thanks you for the recipe. Can’t wait to make this!! Keep on posting more recipes Vivian….love this!